Two in One - Tweet! 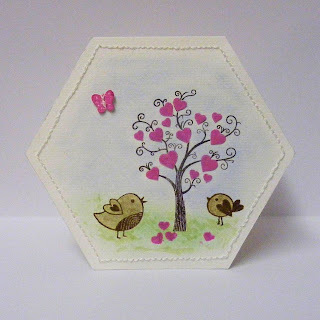 Supplies: Textured, off-white card cut into hexagon shape, hero arts clear design set 'Whoo loves You' Stampin up ink spots, white embroidery thread (ages old stash DMC, I think! )Dovecraft Chalks-Pastels and small butterfly punch. Just thought I'd sneek this one in rather sharpish for the current Papertake Weekly Challenge - Lilac & Lemon. Only just got this done in time. Cardstock and embroidery thread is ages old and from my personal stash... oh and nearly forgot the smattering of diamond stickles around sentiment and on wings. I inked up this little cutie, Cherry Emma (find her at Skattykats) & coloured her with PMs . 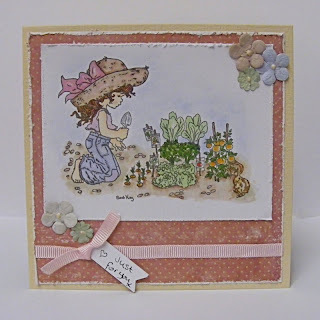 Papers are a MME freebie from a card mag, prima flowers and buttons from my stash. Hope you all have a great evening. I'm A Happy Bunny - Finally! Happy Mums Day! Hope you all had a fab day. There is a challenge over at Skattykats with the chance to win these papers, blooms and ribbons. Hop on over there for a nosey. Supplies: Craftwork Cards blank, promarkers, Sarah Kay stamp - Collecting her vegetables, MME Wild-Asparagus papers, ribbon and prima flowers from stash, liquid pearls in petal pink and pastel chalks. 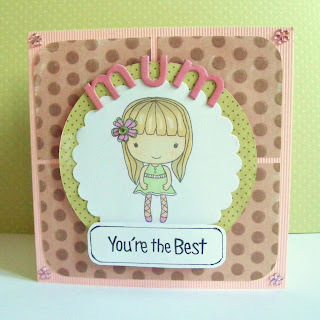 Mums Day is not far away... looking forward to that one, it does'nt matter what I get or don't get, I just love Mothering Sunday as it reminds me of why I wanted to be a mum ... Lol! Just remember that, next time your kids have dumped the whole of their wardrobes contents on the bedroom floor, or told you with half a days notice that they need a costume running up for the school play, or stood there with the 'Kevin & Perry' stance & told you, 'It's so Unfair!' before stomping off in a stroppy huff... oh yes, this applies to girls too you know, not just the boys! There is also a iddy bit of blog candy up for grabs too! 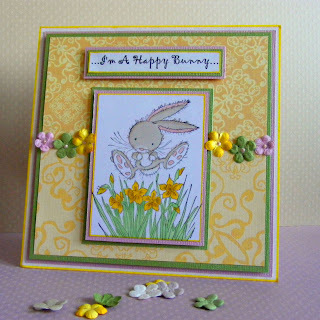 Supplies: Craftwork Cards card blank, Hero Arts Sparkle Clear stamps 'You're the Best,' MME 6x6 Wild-Asparagus Papers, Promarkers & Cherry Arte Chipboard Alpha Sheet.